I am feeling the need to complete something. 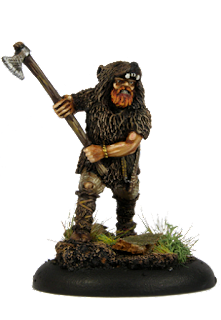 My dwarfs are plodding along as ever, I am still waiting for viking reinforcements, and my Elves are just too overwhelming to contemplate at the moment. I want something to blast through in a short time. 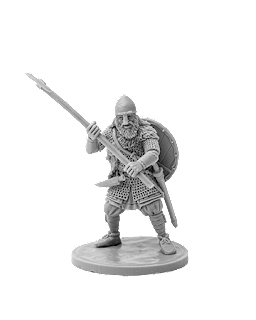 Undead are ideal for this as they are fairly easy to paint, so I am planning roughly a twelve point force for Fantastic Saga. 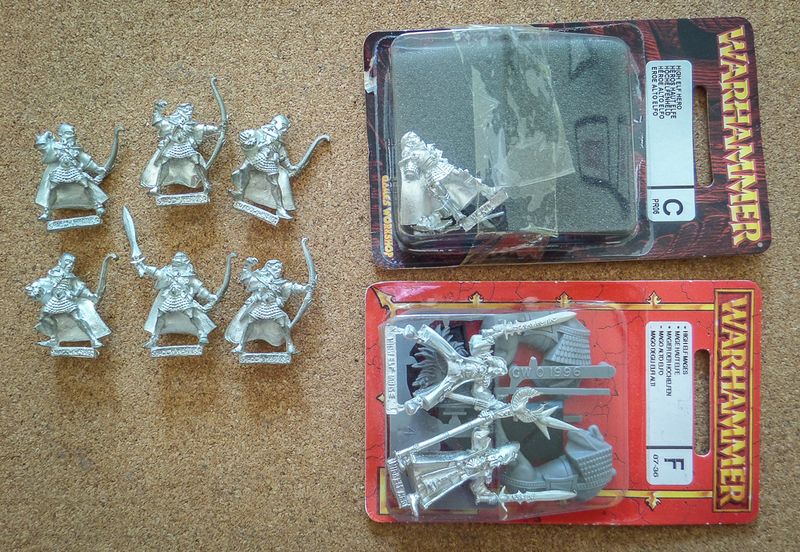 I have made a start, collecting together some already assembled figures to speed up the process. Some of these are already painted (see original post here), but I will probably retouch them a little. I have already made a very rapid start and painted up some ghouls, with zombies next on my list. This old school necromancer will be leading the "fleshy" units. The bone units are still to be built. The personal bodyguard of the thane of Oakenhammer, the renowned OakenGuard. Hand picked from the most valiant warriors or most trusted family members, these dwarfs are equipped at the thane's expense with the finest armour and weaponry of the hold. In return, they take a blood oath to protect and serve the thane - only death in combat or an honorary discharge can end this vow. 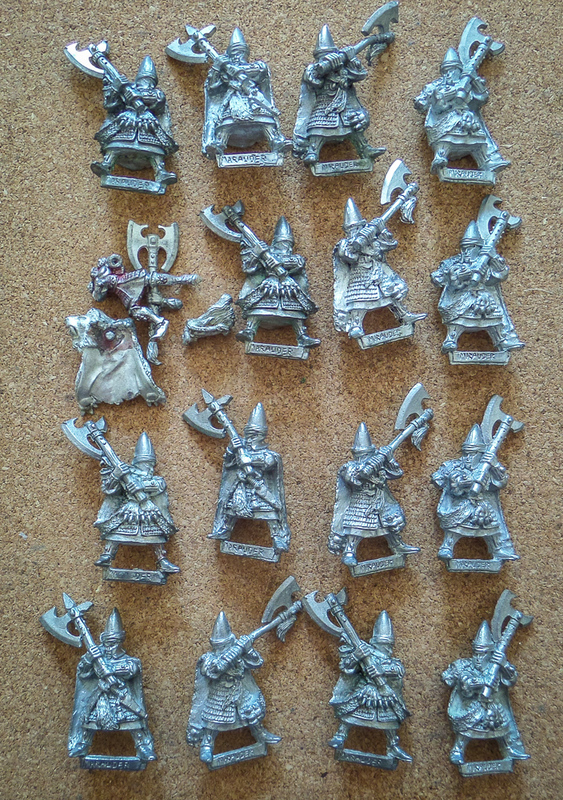 As I detailed in this post, these dwarfs are mostly plastics, some very simple kitbashing. In terms of painting, with them being mostly armour, I have relied on different metallic surfaces to provide a little variety. The axe head decorations and jewels also help to break up the armour. 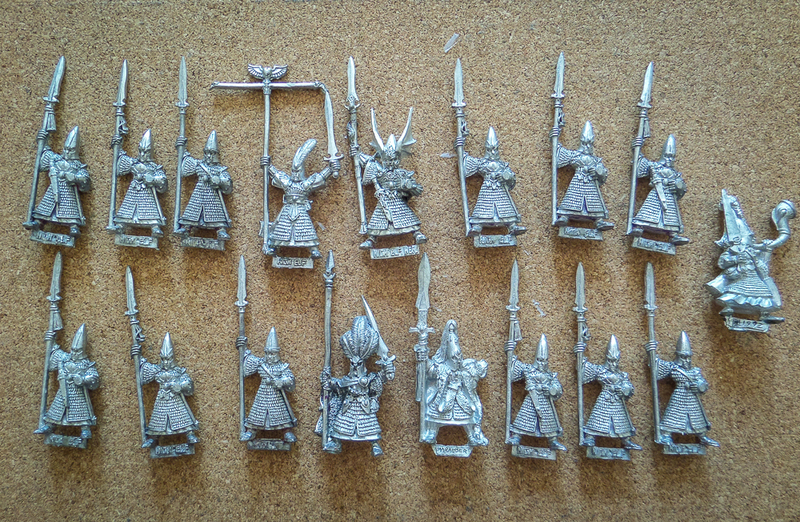 These are the first six of a planned "unit" of twelve. A nice round dozen seems a good figure to me, enough to be a sizeable chunk on a battlefield, but not too many to be a chore to paint. This group contains the captain of the OakenGuard and a horn blower. 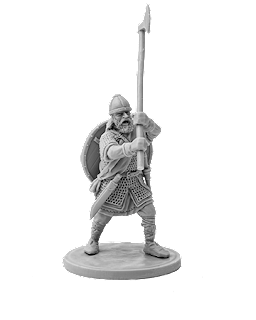 The next batch of six will include the thane's personal standard bearer. 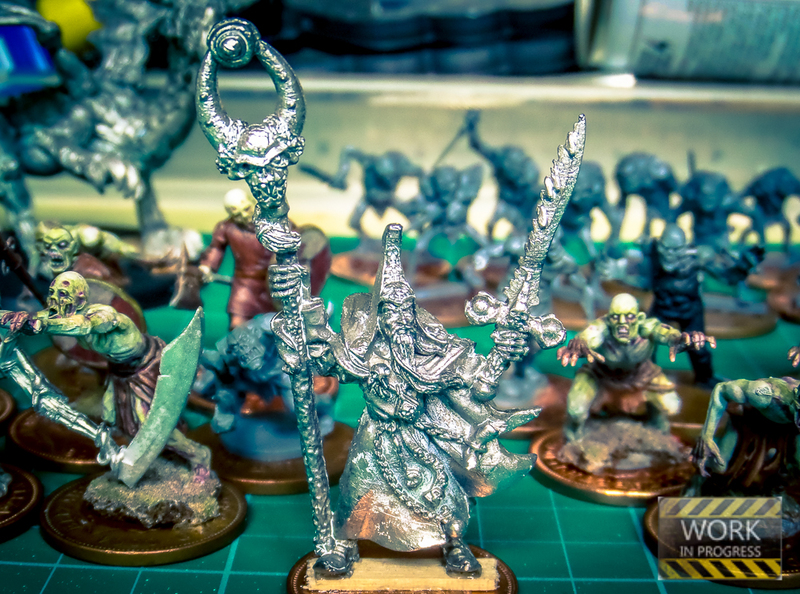 I also have made a start on the thane, as previewed in this post. However, I am switching to a different project to give me a short break from the bearded ones, but will return to them later in the year. 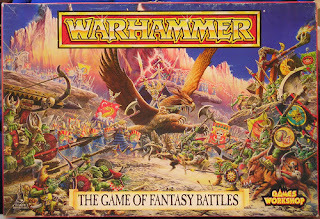 It's twenty-five years since I bought my first copy of Warhammer Fantasy Battle! 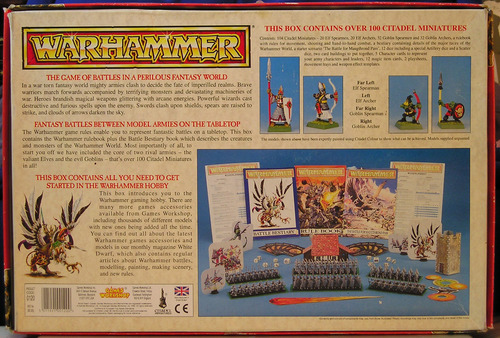 It was the fourth edition of the game rules, but the first time that a boxed set containing two starter armies had been released. I can remember playing my first game with my two brothers on my mum's sewing table using the plastic figures and cardboard heroes. 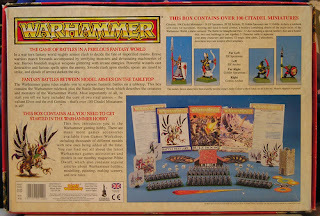 Those two armies were High Elves and Night Goblins - possibly to attract latent Tolkien fans, who knows? It certainly worked on me, I bought into the High Elves in a very big way. 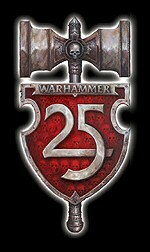 I drooled over the figures and the articles in White Dwarf and bought the army book as soon as I could. Even though the starter figures were all single pose, it really captured my imagination. 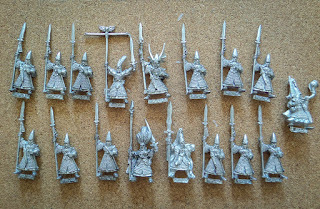 But it was a very daunting task to paint up all that grey plastic to the standard in the books and magazines, so I started with something easier (Undead), hoping to come back to the elves when I had more skill. It was a few years (he said vaguely, obviously unable to remember the exact timeline) before I attempted to paint those plastic elves, but eventually I worked my way through them and even added a few metal figures as I went along. It was a slow process because I was a working man with a young family, hobby time was scarce. I plodded on, grabbing an hour or two here or there every few weekends. After a couple of years (I think), I had painted up the army. It was a huge achievement for me at the time. That army still sits in my glass cabinet, a real milestone in my hobby life. I must get some pictures of it for the blog some time. Fast forward to the summer of 2015 and the sad news that the Old World had been destroyed. 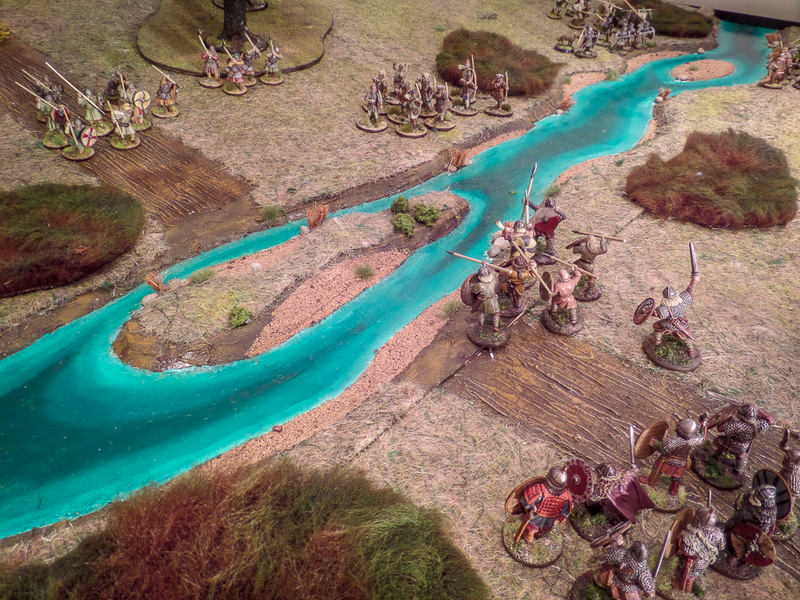 The internet erupted with a storm of rage and indigation, with players abandoning the game, selling off their old armies - there was even one infamous youtube episode of an army being burned. I had gradually drifted away from playing the game by then, but still collected and painted. Luckily not all the rage-quitters were quite so incensed and many expressed their anguish through ebay and forum sales. For a few months, it was a good time to be a buyer. 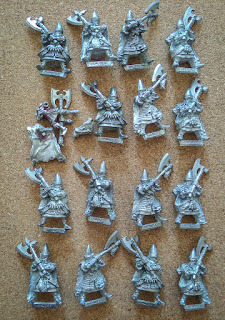 I picked up a sizeable collection of metal elves over that summer and put it to one side. I think it was part nostalgia, part my love of a bargain. Most of the figures below are from that era. 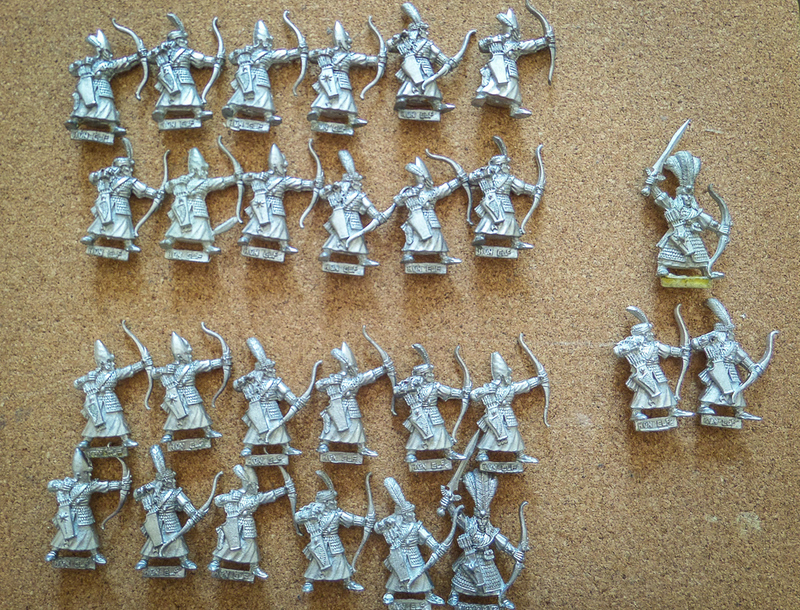 The archers and spearmen are the metal equivalents of that first starter set, while the white lions I think came a little later. 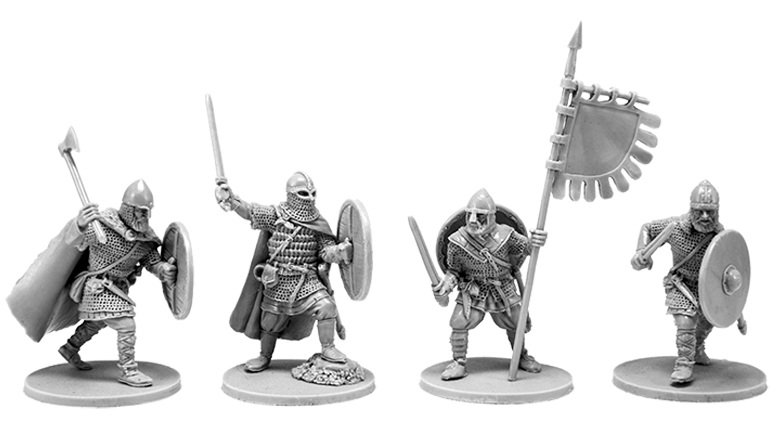 The final picture of shadow warriors and character packs are from much later still, probably sixth edition or so. 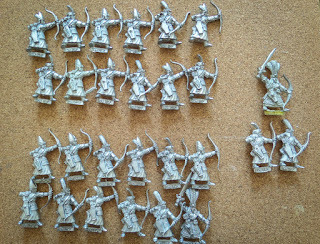 This represents a decent sized army from fourth edition, units were commonly only twelve or sixteen strong (multiples of four were common as ranks back then were just four wide). I have a large amount of mounted figures too, some of them bought back in the early 1990's, some picked up in the rage storm of 2015. It would be nice to do something with these figures, to mark my silver anniversary in the game. Laid out like this, they do have a vaguely jewelled look to them. With all my other ongoing projects it would be complete madness to start another one, but it does seem a tempting proposition. I would base and organise them with Saga in mind, but with fond memories of all those past games of Warhammer Fantasy Battle. Let's wait and see what the summer brings. 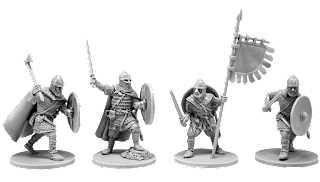 It's my birthday next month - the ideal excuse to add to my collection of vikings. 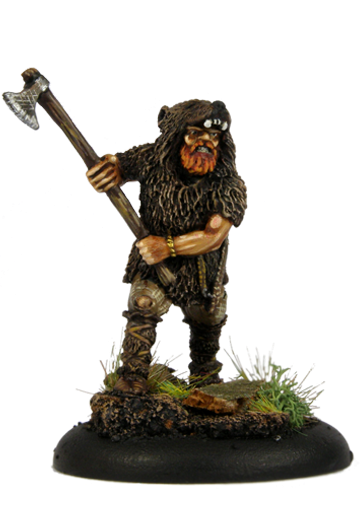 I have been watching the range of V&V Miniatures expand over the past couple of years, and they have got more and more impressive each time. Now seems a good time to make an order with them. 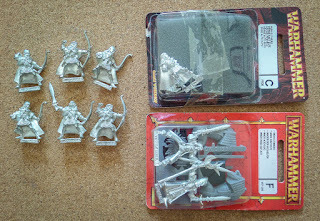 I have read on the Saga facebook page that delivery can take up to a month as they are based in Ukraine - so I am allowing plenty of time for my birthday pressy to arrive. Here's the figures I have ordered, a full review after my birthday of course! Another game from our Age of the Wolf campaign. This was a strange though inevitable situation of having two players controlling four factions - my Vikings facing off against my Danes. 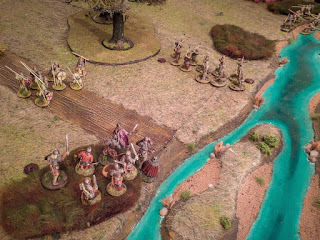 Matt took the Danes and we played Battle at the Fords scenario. Points are scored for troops that have crossed the river at the end of the game - the river bisects the battlefield and there are just two crossing points. At the southern crossing, the Vikings advanced rapidly under fire from Danish archers - no point hanging about to be picked off one by one. It's really annoying losing elite troops to lowly archers, so the poor bondi took the lead and the brunt of the missile fire. 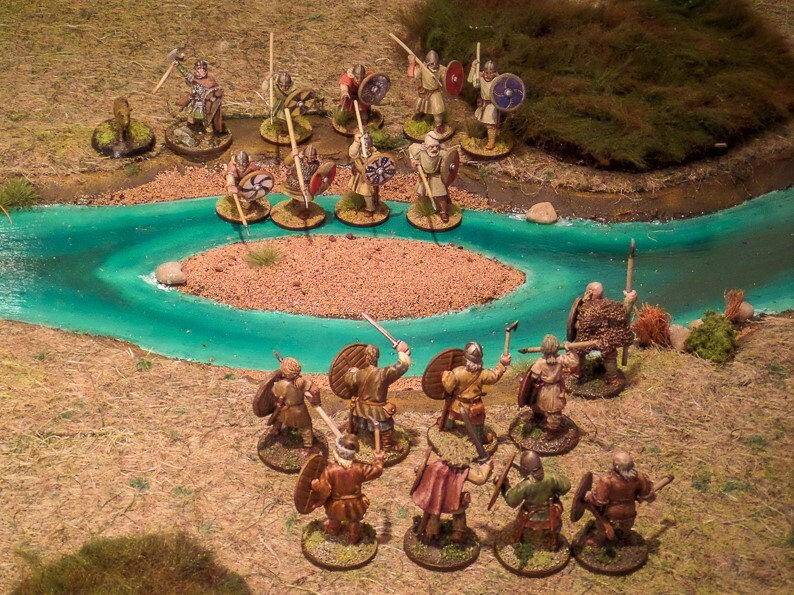 Over on the north bank the Vikings took a more defensive stance, lining the bank of the river and waiting for any Dane attack. This was my general strategy - to attack in the south, hold in the north. There are never quite enough Saga dice to move everything if you want to employ battleboard abilities, so I was quite happy to do this. 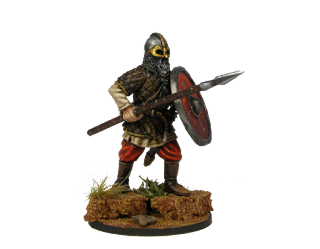 A unit of bondi in front with a small reserve of hirdmen to plug any gaps, keeping a watchful eye on the advancing Danish Lord and his bodyguard. The decisive action was taking place on the south bank. The Viking bondi waded the crossing and exacted their revenge on the Danish archers, slaying a few and forcing the remainder back. Unfortunately this left them tired and easy prey for the Danish hearthguard. 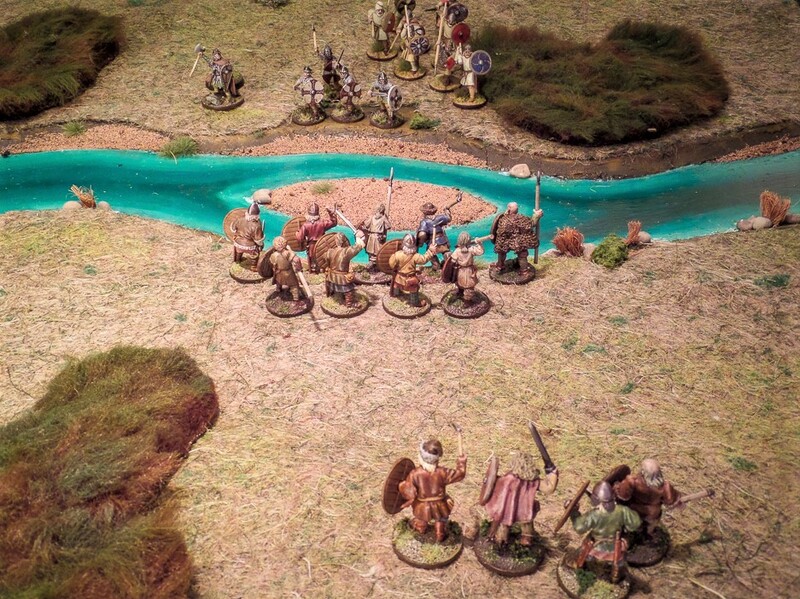 Their sacrifice was not in vain though, as the Viking Lord and his bodyguard waded across the river. On the north bank, the Danish Lord finally took the plunge and surged forward with his bodyguard, crashing into the viking bondi. Ordinarily this would have been an easy combat for the Danes, but I had kept some Saga dice in reserve on combat abilities, allowing me to reroll misses. Thus, the lowly Viking bondi slaughtered the Dane elite and pushed back the Lord. 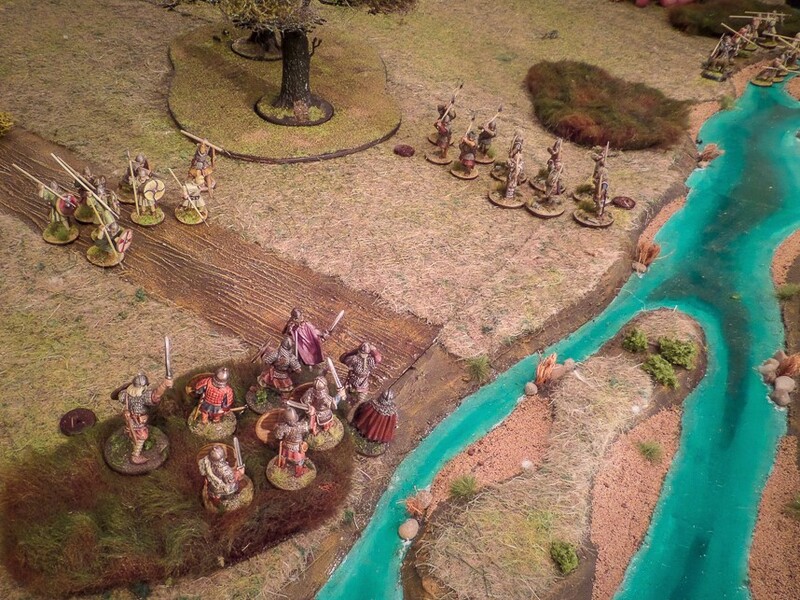 He waded back to the far bank, his warriors helping him out. Back at the south bank, the Vikings took up a position in a patch of boggy ground, just out of reach of the Dane archers. 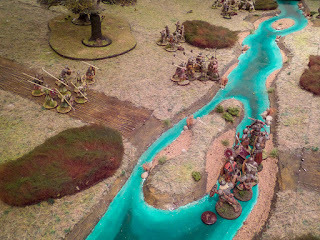 Dane warriors hurtled past them and attempted to cross the river, but were hacked down almost to a man by very annoyed Vikings - back into the river they went and back out again. By now the Danes had utterly lost control of the south bank. In a last gasp attack on the north bank the Danish Lord and his troops faced the viking defending line, but were no match. 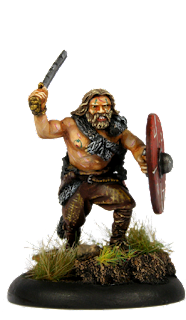 The Danish Lord fell in battle and limped away, jeered by his Norse tormentors. You can read about the Danish lament on Matt's blog. Another good game of Saga. As usual, there never seems to be enough Saga dice to cover all eventualities, forcing some hard decisions to be made (or not - in the case of the Danish Lord!). Though each force is practically identical, the Saga abilities means that each plays in a very different way. This is the beauty of the game to my mind. The campaign system is not quite up to the same standard. Setting aside the very confusing points/units system, the random fate rolls have played a large part in allowing the Vikings to steam ahead. In truth, it's not really suitable for just two players, even though we have four factions between us. It has generated some very enjoyable games, but it's not quite worked out the way we had hoped. Officially we are half way through, it remains to be seen if we will complete the whole thing. 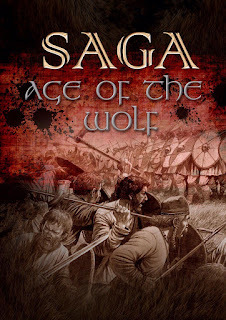 If there were a group of four or five players I think it would work much better - and to be fair this is exactly the set up the Age of the Wolf is designed for. Even if we abandon the campaign, there's plenty more Saga gaming to come.